This is the fifth post from an 8-week cycle drawing excerpts from my book, The Monk’s Cell: Ritual and Knowledge in American Contemplative Christianity (Oxford University Press, 2018). Chapters five, six, and seven work together as a kind of Triduum (the three-day rite of Easter, beginning with Maundy Thursday, following with Good Friday, and concluding with the Easter Vigil). 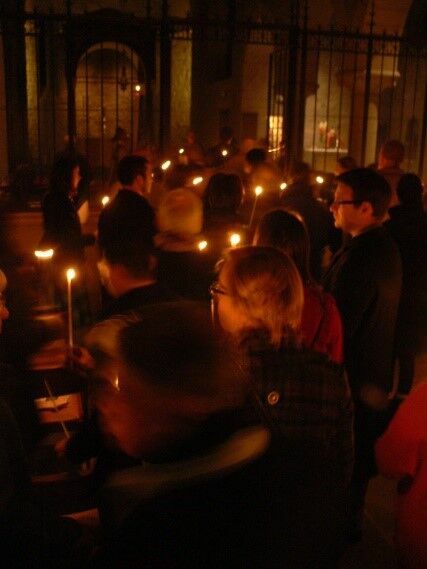 They together describe the relationship of formal ritual, conscious work, and knowledge (especially the phenomenon of interconnectedness that contemplatives call “unitive being”). The fifth chapter, Choir, looks particularly at the ora of Benedictine ora et labora: how contemplative Christianity uses cycles of formal ritual – silence, stillness, movement, sound – to hone attention and contemplative senses. Keenly aware that scripture describes the human body itself as a temple and sacred space, Christian contemplatives with whom I worked considered ritual practices and attunement exercises to be ways of establishing and sharpening their capacity to perceive divine presence through the senses. 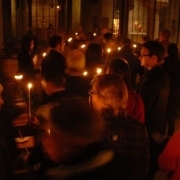 People engaged in formal ritual and the ritualization of everyday life in an effort to become more aware of an immanent divine in both their individual bodies and the collective body, that is, the practicing, observant community that the apostle Paul called ‘The Body of Christ.’ In contemplative Christianity, the idea of incarnation and the development of contemplative senses thus underlay the importance of formal practice and aesthetics at the sites of ritual action. Chapel, person, and community were symbolically and phenomenologically linked. Under the sheltering solidity of stone arches, the choir became a vessel that stirred contemplative senses by marking the shifting tone of liturgical seasons and by giving form to the ephemeral in sound, gestures, and objects. It was the place where monks created a ground of silence into which they sowed chant and spoken word. The choir offered the pungent aroma of frankincense, rising high in paisley helixes from simple bronze dishes, or in voluptuous billows from ornate silver censers as a priest blessed the altar for the Eucharist. It was the place where one felt the shock of cold on face and hands when the Abbot made the rounds of the choir stalls at the end of Compline, showering the people with holy water, and where sharp wine helped dissolve a crumbly, sweet, oversized piece of unleavened bread. There in the choir, shifting medallions of color cast down from stained-glass windows to a checkerboard marble floor, and a monk’s warm touch combined with cool, slick oil or gritty soot as he placed the sign of the cross on people’s foreheads; candles, few or many, towered on the altar in silver, laid low on the floor in ceramic, flickered in jewel-toned glass high on granite ledges, or moved like a river of light in the hands of processing congregants. There one also felt the weighty Daily Office book, held in both hands and braced against torso, or set upon the smooth oak of a well-worn choir desk. Flowers added notes of color and scent: a handful of mauve lilacs at the statue of Mary in Ordinary Time, bowers of red peonies at the choir’s center at Pentecost, or nothing, only their absence, in the depths of Lent. Add to this aesthetic world the sometimes wrenching physical effort of waking at dawn or earlier, then sitting, standing, bowing, and kneeling with the community’s ceaseless tide of liturgy, ever moving regardless of one’s energy, lethargy, engagement, or indifference. Reminder: For those who are interested in purchasing a copy of The Monk’s Cell, you can receivea 30% discount by ordering online at global.oup.com/academic with promotion code AAFLYG6.